Sample of business letter and personal application letter formats in word file. Download doc/xls/pdf file example. For the sake of business every businessman has to maintain a relationship with the government departments as well as private agencies and individual persons. So he has to exchange information with different parties in the way of placing order for goods, granting or applying for credit, acknowledging and executing orders, complaining about delay or mistake in supply of goods, and so on. For doing the above he has to make a lot of correspondence which are otherwise termed as business letters. In short business letters are essential tool for the businessmen to run their business. So, effective business letters are the key to business department. Hence the essentials of a business letter can hardly be over emphasized. There are many modern communication methods available today, but the traditional business letter remains an important means of sending printed messages. As the business letter acts as an ambassador for the company, it is vital that it gives a good first impression. In this respect, it is good business practice to ensure good quality stationery and printing of the letterheaded paper. The fully blocked layout is now the most widely used method of display for all business documents. This style is thought to have a businesslike appearance. This layout reduces typing time as there are no indentations for new paragraphs or the closing section. Open punctuation is often used with the fully blocked layout. Again this reduces typing time because there is no need for any unnecessary full stops and commas. Although fully blocked layout is used by many organizations some still prefer to adopt their own in house style for document layout. Whichever layout you use for your business documents, the most important rule is consistency, i.e. ensuring that all documents are displayed in the same format. Fully blocked layout with open punctuation has been used for all the specimen documents in this book. 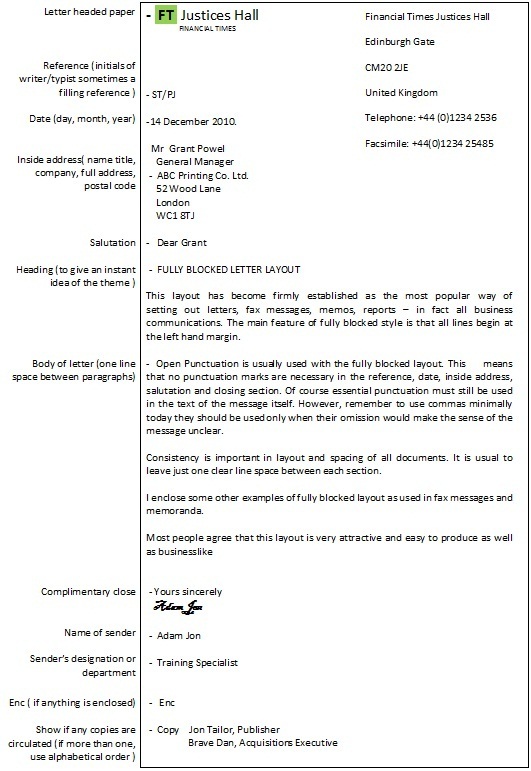 In the business letter shown here, note the consistent spacing (only one single line space) between all sections of the letter. In the past letterheads used to have �our ref and �Your ref printed on them. Today this is rarely the case because with modern word processors and printers it is difficult to line up the printing on such pre-printed stationery. Instead, the typist normally inserts the reference on a line on its own. The reference includes the initials of the writer (usually in upper case) and the typist (in upper or lower case, as preferred). A file or departmental reference may also be included. In some other countries the date is typed in the order month/day/year, often with a comma after the month. The name and address of the recipient should be typed on separate lines as it would appear on an envelope. Care should be taken to address the recipient exactly as they sign their letters. For example, a person signing as �Grant Powel should be addressed as such in the inside address, preceded with the courtesy title �Mr. To address him as Mr G Powel would not be appropriate. If a letter is confidential it is usual to include this as part of the inside address, one clear line space above line. This may be typed in upper case or in initial capitals with underscore. Some decades ago an attention line was used when the writer simply wanted to ensure that the letter ended up on a certain person's desk, even though the letter was addressed to the company in general, and always began Dear Sirs. In today's business letters, it should rarely be necessary to use an attention line. When you know the name of the person you are writing to, the name of the recipient should be included in the inside address and a personalized salutation will be used. If the recipient's name has been used in the inside address, it is usual to use a personal salutation. If your letter is addressed generally to an organization and not to a specific person, the more formal salutation Dear Sirs should be used. If your letter is addressed to a head of department or the head of an organization whose name is not known, then it would be more appropriate to use a salutation as shown here. It is customary to end the letter in a polite way by using a complimentary close. The two most common closes are �Yours faithfully (used only with Dear Sir/Sirs/Sir or Madam) and Yours sincerely (used with personalized salutations). After the complimentary close 4 or 5 clear spaces should be left so that the letter can be signed. The name of the sender should then be inserted in whatever style is preferred upper case, or initial capitals only. The sender's designation or department should be shown directly beneath his/her name. In these examples note that the title �Mr is never shown when the writer is male. However, it is usual to add a courtesy title for a female; this is shown in brackets after her name. When a letter has to be signed on behalf of the sender, it is usual to write for or PP is front of the sender's printed name; pp is an abbreviation for per procurationem, which simply means on behalf of.
? Affix a coloured �enclosure sticker usually in the bottom left hand corner of the letter.
? Type three dots in the left hand margin on the line where the enclosure is mentioned in the body of the letter.
? Type �Enc or Encs at the foot of the letter, leaving one clear line space after the sender's designation. This is the most common form of indicating enclosures. When a copy of a letter is to be sent to a third party (usually someone in the sender's organization) this may be indicated by typing �cc (copy circulated or courtesy copy) or �Copy followed by the name and designation of the copy recipient. If there are two or more copy recipients, it is usual to show these in alphabetical order. If the writer does not wish the recipient of the letter to know that a third person is receiving a copy of the letter, then �bcc (blind courtesy copy) is used. This should not be shown on the top of the letter, only on the file copy and bcc copy/ies. Tips : Don't send a cc to everyone you know just send them to people who need to know. Open punctuation is commonly used with fully blocked layout. Only punctuation marks that are essential to ensure good grammatical sense are included within the main body of the message itself. All other commas and full stops are omitted, especially in the presentational aspects like the date, inside address, etc. Tips: with commas, the rule is now less rather than more. No use full stops and no commas at the end of lines. No use comma in salutation. Tips: use open punctuation and remove a lot of the clutter from your writing and presentation.